La Table des Marchands, France. Location: Lochmariaquer, Brittany, France. Grid Reference: 47° 35' 45.47" N. 3° 3' 13.57" W.
La Table des Marchands: (Passage Mound). 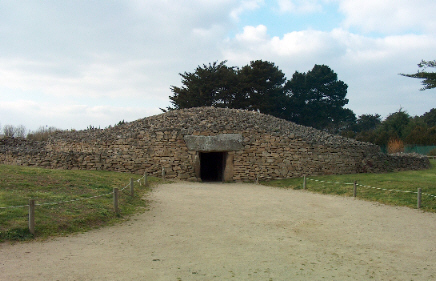 This passage-mound is situated alongside the Le Grand Menhir Brise, and the Er Grah tumulus which combine together to form the Lochmariaquer site. 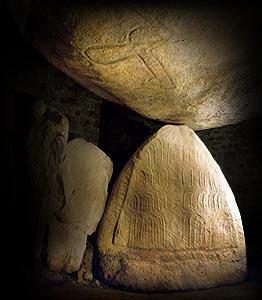 The capstone has been shown to have once been a part of a larger stone, which is believed to have once stood alongside Le Grande menhir Brisé in an alignment of 19 stones. La Table des Marchands: (The Merchants Table). The location of this neat little passage-mound betrays its obvious importance. It was built only yards from Le Grand Menhir Brisé, once the tallest menhir in Europe, and the centre stone for the great lunar observatory at Carnac. The mound has been restored five times since 1811, denying us the means of ever seeing it again in its original form, but it still contains two huge engraved stones that reveal much about the builders of the mound. Firstly - The builders re-used stone from the original construction at the site (radio-carbon dated at 4,500 BC). The capstone, and possibly the 'end-stone' are parts of larger menhirs that were already quarried, moved and cut long before the mound was built. It is therefore probable that at the time of construction (Approximately 3,000 BC), that the area had already achieved recognition. Secondly - The construction that proceeded the Table des Marchands (See Le Grand Menhir Brisé), was designed to measure the lunar cycle, whereas the Table des Marchands is orientated to the mid-summer sunrise (and Gavrinis to the winter solstice). This indicates a dramatic shift in thinking. 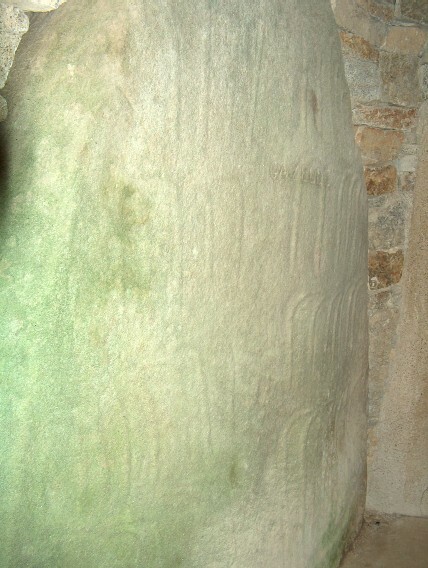 The re-use of masonry is a common thing, even with such obviously important stone, but the fact that the stones were not re-engraved tends to suggest that the engravings themselves may have had an importance of their own. It is curious therefore that the engravings were left face down and visible at La Table des Marchands, but were placed face-up and therefore hidden at Gavrinis. This capstone is said to measure 21ft long, 12ft wide and is 6ft thick, and is estimated to weigh 40 tons (2). The capstone has been shown to be just a part of another, larger stone (above, right), which was broken and re-used in at least three other sites. Another part of the original stone was found to have been used for the capstone of the Gavr'inis passage mound, where the images were placed on the upper, hidden side of the stone, and yet another part of the same stone was used for the capstone for the neighbouring Er Grah tumulus and a small piece from the top is now lost to us. 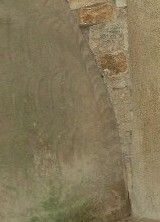 The engravings on this stone are continued on the capstone at Gavrinis. The End-stone - The supporting stone on the far wall of the chamber is also heavily carved. It is this stone that receives the midsummer sunlight. This stone is sandstone, the nearest source being 10km distant. (3) It is now believed to have been standing before the dolmen, passage and mound were built over it. 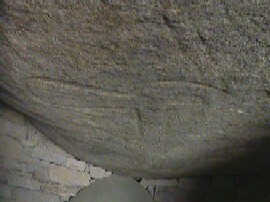 (7) This stone may well have been a part of the original construction, standing at the end of the 19-stone alignment with Le Grand menhir brisé being the tallest stone at the site. The huge 60 ton capstone rests on a mirror of itself, now considered to have been an original feature from the earlier phase dating back to 4,500 BC. 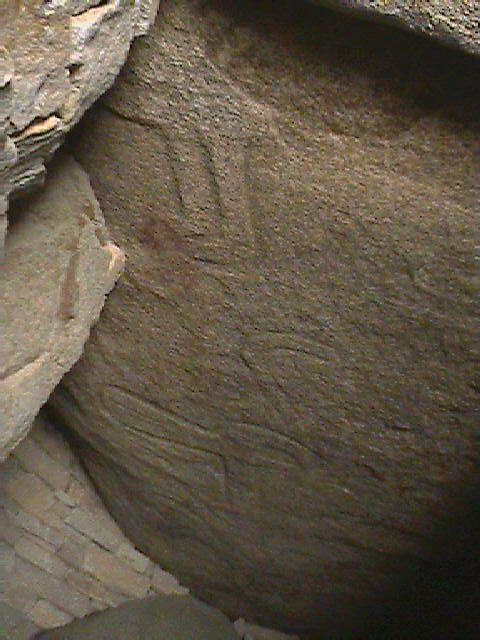 The exact relevance of the 'shepherds crooks' on the centre face is unknown (The same shape also appears frequently in Portuguese megaliths). 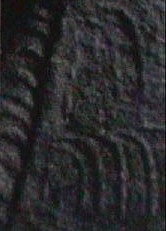 However, the 56 crooks and the 19 crescents on the sides of this stone have led some to speculate that they may represent a lunar count. Chronology - The construction of the dolmen, passage and mound was at around 3,900 to 3,800 BC, although it is suggested that the end-stone was already in place before the dolmen and 'cairn' were constructed around it. the end-stone itself dates back with the original construction (19-stone alignment) to around 4,500 BC. The site has been used as a quarry by the Romans and again over the ages until it was recorded bare in 1870 and only the dolmen remained (see photo below). Archaeo-astronomy - The chamber points in the direction of the sunrise on midsummer's day. 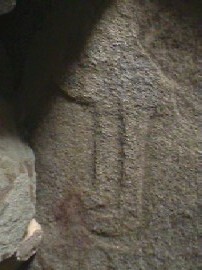 The large stone at the end of the chamber is covered with symbols that have been variously interpreted. 1). Felix. R. Paturi. Prehistoric Heritage. 1979. Macdonald and Jane's Publ. 2). Julian Cope. The Megalithic European. 2004. Element Books.